The Level 1 Spirits online course is a 4-week program. An online tutor guides the WSET online classroom. Weekly topic can be viewed by logging into the online classroom anytime during the week (there are set start and finish dates for each week, but no set class time). At home, tasting activities are also provided to familiarize students with a systemic approach to tasting at an intermediate level. When the course is over, students arrange with American Wine School to take the exam in person at an American Wine School location. Online exams are available in Chicago and Cleveland. This entry level course provides basic information on spirits. Discover the main styles and types of spirits through sight, smell, and taste to develop an understanding of the key factors affecting flavours and aromas, and how cocktail recipes work. 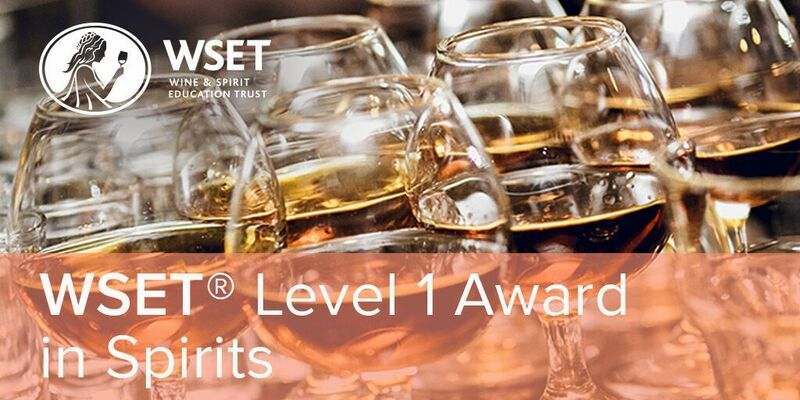 Perfect for people new to the world of spirits, this course results in a WSET Level 1 Spirits certificate and is a great starting point for most novice consumers. The Level 1 Spirits Online Learning course fee includes study kit and exam fee. The total cost is $175 per person. All exams take place in Chicago or Cleveland. 01S1801 Dec 17, 2018 05 Jan – 01 Feb Feb 9th, 2019 at 10am Sofitel, 20 E. Chestnut St.
01S1902 May 24th, 2019 08 June – 05 July July 13th, 2019 at 10am Sofitel, 20 E. Chestnut St.